Horde survival at its brainiest. When something comes to Earth from outer space, it usually does one of two things: gets valet capsule retrieval service from NASA, or kills all the dinosaurs. The horde survival arcade game It Came from Space, and Ate Our Brains breaks that rule, because these aliens have arrived and are ready to slurp down some juicy pink human brain. The star of the brain-eating show is Jerry, an ordinary guy with a flashlight and maybe a weapon or two. Jerry survived the alien invasion, but from the looks of it he's pretty much the only one. Comb through the cities and towns as you search for weapons and items to help fight off the baddies, then actually fight off the baddies and go for a new high score. Simple arcade gameplay made extraordinary by the variety of settings and the tongue-in-cheek humor. The good new for Jerry is that a few other people did pull through the invasion, assuming you have a few real world friends who want to play. 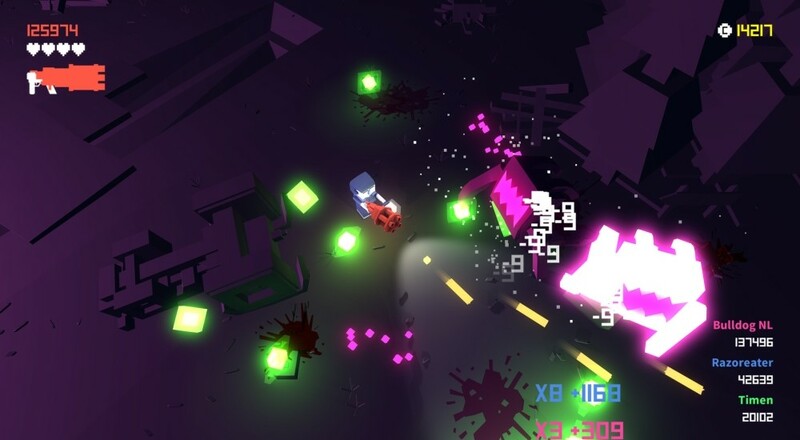 It Came from Space, and Ate Our Brains supports co-op for up to four players, splitting the survival duty amongst teammates to ensure everyone lives together, upgrades weapons together, or gets their brains eaten together. It Came from Space, and Ate Our Brains is currently available from the official website as well as Steam. There's even a handy four pack to make recruiting fellow survivors a little easier. We've also added a few minutes of footage of a three player co-op stream of the game.